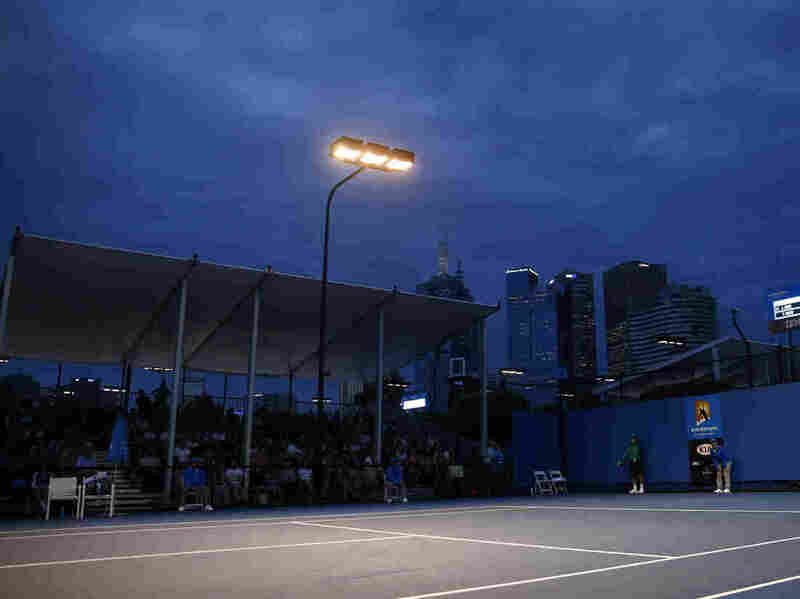 Allegations Of Tennis Match-Fixing Overshadow Australian Open : The Two-Way The BBC and BuzzFeed published an expose about match-fixing in tennis but did not name names of implicated players. Some people, including Roger Federer, have called for the release of names. The BBC and BuzzFeed published an investigative report alleging widespread match-fixing and corruption in the sport of tennis. The report was released just before the start of the Australian Open. No. 5 seed Rafael Nadal lost in the first round of the Australian Open to fellow Spaniard Fernando Verdasco in a five-set thriller on Tuesday. It's only the second first-round loss in a major tournament for the former world No. 1, and the upset was the headline of the tournament so far — or, at least, it would have been. On Sunday, the BBC and BuzzFeed published an investigative report alleging widespread match-fixing and corruption in tennis that is reverberating around the world. The report — based on information from a "cache of leaked documents" from a 2008 probe commissioned by tennis authorities, the statistical analysis of 26,000 tennis matches and betting information from 2009 through 2015 — alleges that some players were paid to throw matches and that tennis officials did not act on the findings. The report says there is evidence that "winners of singles and doubles titles at Grand Slam tournaments are among [a] core group of 16 players who have repeatedly been reported for losing games when highly suspicious bets have been placed against them." The report also accuses the Tennis Integrity Unit, which was created following the 2008 probe, of not sufficiently pursuing and prosecuting allegations of match-fixing. Top tennis officials have categorically denied this. "The Tennis Integrity Unit and tennis authorities absolutely reject any suggestion that evidence of match-fixing has been suppressed for any reason or isn't being thoroughly investigated," ATP Chairman Chris Kermode said at a news conference Monday, according to The Associated Press. The report, which also alleges that one top-50 player competing in the Australian Open is suspected of "repeatedly fixing his first set," did not name the implicated players, saying it couldn't definitively prove they were involved in illegal activities. John Templon, the BuzzFeed reporter who collaborated on the report, told NPR's All Things Considered that the exposé was meant to serve as a call to action for tennis authorities to crack down on match-fixing and betting in the sport. World. No. 3 Roger Federer, however, said the names needed to be released in order for the sport to move forward. "I mean, it's, like, who, what? It's, like, thrown around. It's so easy to do that," Federer said according to The Guardian. "I would love to hear names. Then at least it's concrete stuff and you can actually debate about it. Was it the player? Was it the support team? Who was it? Was it before? Was it a doubles player, a singles player? Which slam? It's so all over the place. It's nonsense to answer something that is pure speculation." Roger Federer called for the release of players' names who were implicated in match-fixing. The No. 2 player in the world, Andy Murray, said he would not be surprised if match-fixing was happening, even at the sport's elite levels. He said: "I've been aware of it since I was quite young and I think when people come with big sums of money when you're at that age, some people can make mistakes." At a press conference, the current top player in the world, Novak Djokovic, said he was approached to throw a match in 2007. He said someone propositioned a member of his team, offering $200,000 if Djokovic lost a match at the St. Petersburg Open in Russia. Djokovic said the offer was rejected and that he didn't even play in the tournament. He went on to say that the sport has come a long way since 2007 and that he doesn't think that match-fixing is a problem at the top levels of tennis. Serena Williams, too, dismissed the allegations. "I play very hard and every player that I play plays very hard," she said at a press conference. "If that's going on, I don't know about it." Paul Scotney, the director of Sports Integrity Services, was one of the lead investigators during the probe into tennis match-fixing back in 2008. He told NPR's Morning Edition that the investigation uncovered a number of suspicious bets. He also said that tennis is "one of the three top sports for betting," along with horse racing and soccer, and that that's not going to change. "So the facts are, it's a bet-on sport and will continue to be a bet-on sport, and authorities need to understand that and work closely with the betting operators because of that," Scotney said.